Review – Kaguya-sama: Love is War vol.1 | Friendship! Effort! Victory! What is it? 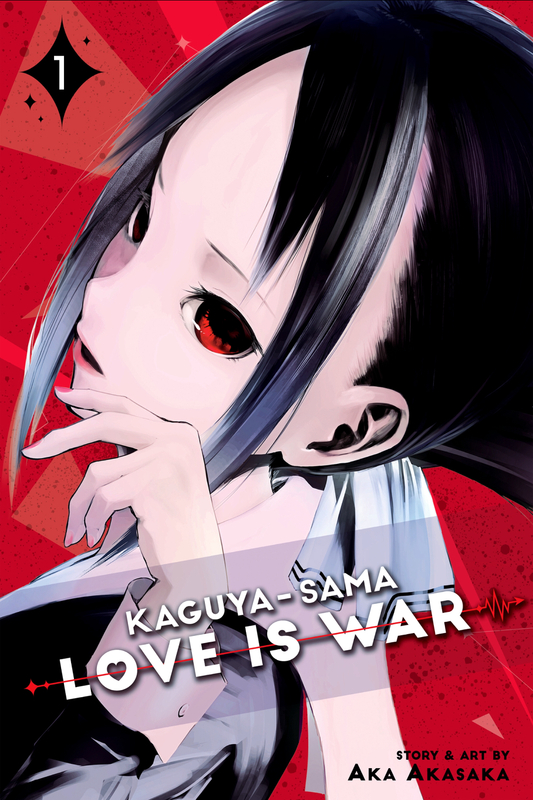 : Kaguya-sama: Love is War is an ongoing comic from Shueisha’s Weekly Young Jump magazine (and their currently defunct sister publication Miracle Jump), based around one key concept; that love is a battle of dominance, and that to be the one in power require the person not giving an inch, even to the point of not being the one to confess their feelings first! And so we’re presented with two members of the student council at the prestigious Shuchiin Academy; Kaguya Shinomiya, the well-bred and royal-rich sheltered queen of the council, and Miyuki Shirogane, the handsome wunderkind and president of the student council. Both are hilariously vain, self-involved, emotionally stunted, and very, VERY in love with each other. But what’s a pair to do when they each refuse to be the one to admit it? Why, warfare, of course! Endless battles of the mind to give one up over the other and get their heart’s desire; a confession from the other. What I think about it: I’m not entirely sure what I was expecting in the lead up to this release, Kaguya-sama being announced in a larger announcement covering four series that I just did not really have any opinions on at all. Two things happened in recent history, however, that had me paying attention. The first was me seeing the cover art, the sort of spectacularly fat-free design that, while not really reflecting the wacky comedy inside the book, catches the eye something fierce and pulls you in. The second was hearing the occasional utterance that it’s not dissimilar from Lies of the Sheriff Evans, a Weekly Shonen Sunday series that spends most of its time focused on the over-thinking of the outwardly cool titular sheriff as he tries to find a woman willing to take him. I’m an enthusiastic fan of Evans, and so the idea of their being a comic even a little bit like that available in English made Kaguya-sama a worthwhile gamble for me. Thankfully, that’s paid off. Kaguya-sama: Love is War is raucously funny, somehow managing to repeat the main formula (an opportunity comes up for either Kaguya or Shirogane to try to manipulate the other to confess, it turns out the other is trying to make them do the same, and both insanely overthink the situation until either nothing happens or one of them gains the tiniest victory over the other) without it ever becoming tired, thanks in part to the rare break in the pattern with chapters that flesh out one of our pair some more. A part of it is in the absurdity of each situation, like a chapter where a game of Old Maid turning into a Death Note-esque battle of the minds, or in the sheer stupidity of our protagonists; both are academically gifted, but almost completely lack functional social skills or an understanding of how other people think, so you get to see their plans balloon up out of hand without them ever realising when they’re going too far, or even when the other might be receptive to them. More than that though I’d put the success of its brand of repetitive comedy to just how darn likeable our duo are. It would be far too easy to roll into Shirogane’s brand of academic overconfidence or Kaguya’s sheltered upper-class life for our gags here, both are decent fonts of humour in themselves, even if they’re not relatable to an average-looking, working-class fella like me. But it speaks volumes to Aka Akasaka’s writing skills that he’s able to take character types that aren’t hugely accessible and dig deep into them for more universal ideas, usually in the way they approach their romantic feelings for each other. That obliviousness, the cute way they kid themselves that they’d TOTALLY take pity on the other if only they’d admit they love each other, or more than anything else, the imaginary sequences that dot the series where Shirogane pictures what would happen if he showed a flaw, always ending with a demeaning look from imaginary-Kaguya, saying “how cute”. That level of anxiety speaks to me hugely, at the same time as making me laugh like a maniac. And the rug pulls, OH the rug pulls. A chapter based entirely around the game of 20 questions, spending almost all of its pages building up to what seems to be Kaguya using the game to admit that she likes Shirogane, managed to destroy me with an absolute last second fake-out that was as cruel to the reader as it was stupidly funny, having been choreographed all along. Faking the reader out is really important when it comes to making a series like this last, gag romances not being well-built for longevity, making you feel like something almost happened and maybe, just maybe, next time it really will (it won’t). It’s a clever way of keeping the structure functional, and I’m optimistic that it’ll keep the series fresh across the rest of its run. Finally, some thoughts on the art. It’s beautiful? That shouldn’t be a surprising factor, but gag manga have a tendency to put art second to the jokes, so unless you’re an absolute legend like Osamu Akimoto I don’t think that I’d go into any gag comic expecting a careful use of screentone in Kaguya’s hair, or a fantastic double-page spread of Kaguya riding on the back of Shirogane’s bicycle. The backgrounds can be a little… functional, but the character work is undeniably fantastic, with those all-too-essential expressions that sell every moment to the reader. And the lettering (which yes, is a part of the art) is some solid work too. It can be far too easy for manga companies to settle on lettering that just gets the job done, or in the case of sound effects to leave them untouched and leave the tiniest indication of what they’re for. For companies like Viz, and letterers like Stephen Dutro, it’s appreciated that they go the extra step to have english effects that blend well with the original art. A challenge in lettering; to keep the reference clean or to prepare for what comes next? This praise isn’t to go without a small moment of awkwardness. There’s a chapter later on in the volume where Shirogane is asleep, and his and Kaguya’s friend and member of the student council Fujiwara writes on his head the kanji for meat, 肉. This is an out-and-out reference to the manga Kinnikuman, and the same kanji being on the forehead of its main character. By re-lettering it as meat, the reference is lost, even with the footnote that acknowledges the reference (without the kanji being present), but to not do so would make the following page, where Fujiwara expands the writing to say ‘meathead’, a difficult challenge; would you leave in the original japanese and have two gags that require footnotes, or sacrifice the original reference as they have done to make that joke, the easier to understand joke that doesn’t require one to know what Kinnikuman is, function as intended. As I sat down to write this review I still didn’t have a clue what option I would have gone for myself, and whilst I edge towards what they’ve actually done, the Jump nerd in me feels sorrier for it. But that’s one moment in a comic full of gags that otherwise survive the transition between languages intact and funny as heck. I can’t say I came into Kaguya-sama expecting much, but coming out of this first volume I’m firmly a fan, and ready for more in… two months? Not a bad wait at all. If you enjoyed this review consider dropping me a few pennies over at Ko-Fi. Comics ain’t cheap, but I am. This entry was posted in FEV REVIEW by Maxy Barnard. Bookmark the permalink.